Sweeping, accessible beaches and hidden bays reachable only by boat. Vietri sul Mare boasts some of the largest beaches on the Amalfi Coast which, together with the town's strategic location on the historic Naples-Salerno railway line and its proximity to the A3 motorway, make it one of the area's most popular bathing resorts, especially in high season. To avoid the crowds and enjoy the beaches to the full, you'll want to arrive early in the morning, or visit in low season. From Vietri's Marina Grande, boats operated by the Al Rais Cooperative take visitors to the romantic little bays which can only be accessed from the sea. Here you can enjoy blissful moments of peace and tranquility. La Baia is the first beach you'll come across traveling from Salerno. 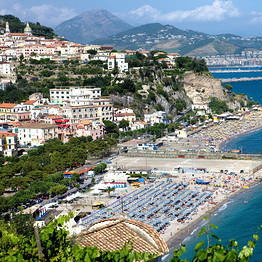 One of the few sandy beaches on the Amalfi Coast, La Baia is also one of the longest (measuring some 400 meters). 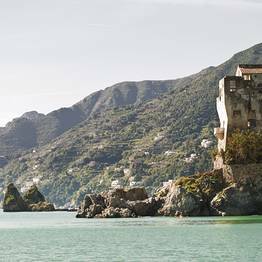 Easy to reach by car or public transport, the beach's vicinity to the busy port of Salerno means that the sea is not always as crystal clear as in other parts of the Amalfi Coast. A long-standing favorite with families, the beach has a number of well equipped bathing establishments and catches the sun for much of the day. A beach guarded by a 16th century tower and looking out at the Due Fratelli, Vietri sul Mare's famous sea stacks. The beach has a private bathing establishment with a car park and is usually quiet. A beach of recent construction, created, quite literally, overnight, by the 1954 flood which submerged the coast all the way from Vietri to Minori. Vast quantities of mud and debris rolled down the valley adding circa 100 meters to the beach and creating a sandy seabed which was previously nonexistent. Today the beach is divided by the river Bonea. On one side of the river, the beach is occupied by a large bathing establishment, on the other side the beach is "free". From here, boats belonging to the Al Rais Cooperative sail holidaymakers to the little bays which are either extremely difficult or simply impossible to reach on foot. Like the majority of the old settlements on the Amalfi Coast, Albori was built high up on a hill and connected to the sea by a series of steep pathways. Today's visitors can reach the beaches of Marina d'Albori more easily, using the steps which commence at km 48 of the SS168, not far from Vietri. The beaches of Marina d'Albori catch the sun until late afternoon. By car: From the A3 motorway exit at Vietri sul Mare. Within meters of the beach there is a public car park. A charge will be made for parking between 07.00 and 20.00hrs. A number of bathing establishments have their own private car park. By public transport: Sita Coach Company (Salerno-Amalfi line) or CSTP buses no. 1, 4 and 9 from Salerno. The number 68 bus runs between the center of Vietri and the Marina. Vietri is the only town on the Amalfi Coast to have a railway station, offering regular train services to Naples and Salerno.